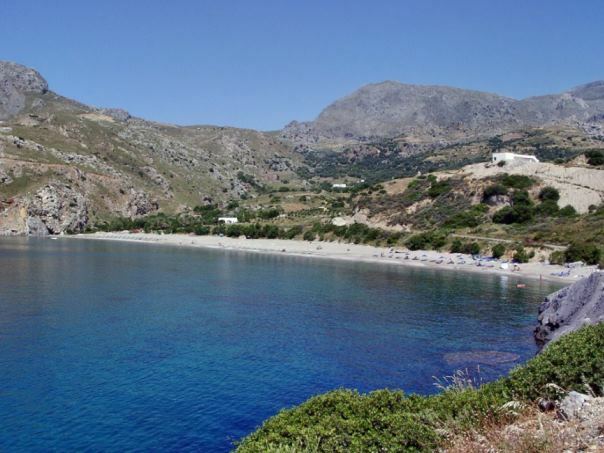 Souda beach is located 40km south west of Rethymno town, and just 3km west of the cosmopolitan resort of Plakias. This long sandy beach lies at the exit of a valley, run by the small river Finikas which has water all year round. Umbrellas and sunbeds, showers, lifeguard, cafes, snack bars, taverns, fish taverns, accommodation, beach volley, water sports, sea bikes and canoes. Along river Finikas (i.e. Palm tree) which exits at Souda beach, as well as in the surrounding area, there are colonies of the rare native Cretan palm trees of Theophrastus which offer an exotic hint to the beach. Souda beach is affected by the southern winds which raise the sand, making it difficult for the visitors to stay on a windy day. The rocky ends of the beach are ideal for snorkeling while the waters are safe for families with small children. Due to its large size, Souda beach rarely feels overcorwded. During the 90’s, it used to be a hideaway for naturists who still keep visiting the eastern part of the beach. Souda beach is accessible by rented or private cars and motorbikes. If you choose to drive from Rethymno town, follow the provincial road Melambon-Agias Galinis to the south. Turn right towards Moni Preveli (Preveli Monastery). 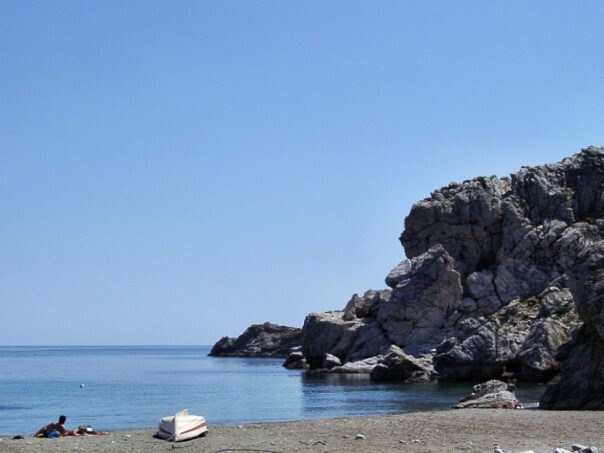 When you reach Plakias, drive for about 3km western till you reach Souda beach. You may also use the public bus from Rethymno to Plakias and then walk 3km to Souda beach or take a taxi. There is also a tourist train running from Plakias to Souda beach.